Figures 1 and 2 and the accompanying descriptions are the components of this treatment approach. Patient’s elbow is supported in a 90 degrees flexion, fully supinated position. DTFM is applied with the thumb at the common extensor tendon just anterior to the epicondyle. Frictions were applied for 10 minutes prior to the Mill’s manipulation. 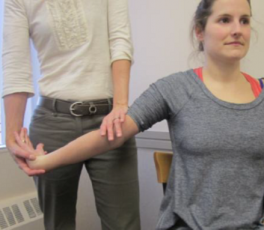 Patient is in sitting with arm in abduction, internal rotation such that the olecranon faces upwards, forearm fully pronated and wrist in flexion. 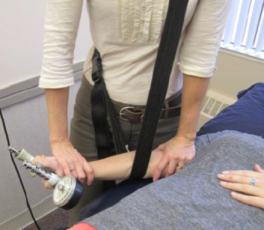 Therapist’s one hand supports the wrist flexion, the other hand placed over the olecranon. Maintaining this position the therapist applies a high velocity, low amplitude thrust through the olecranon. Patient is in supine with their arm by their side, elbow extended and forearm pronated. 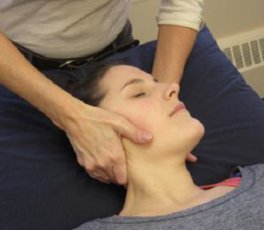 A lateral glide is applied to the radius and ulna with the therapist’s hands or using a belt around the therapist’s shoulders. The patient then either grips or extends the wrist against resistance as long as this is now pain-free. 6-10 repetitions are performed in a single treatment session. Mobilizing hand wraps around the head and neck to the level of the C5/6 segment. A Grade III lateral glide is applied contralateral to the effected side. A depression force is applied to the ipsilateral shoulder girdle. Grade III or IV mobilization of hypomobile segment found on assessment. Grade III or IV mobilization of the hypomobile segment found on assessment. Cervical spine is locked using side flexion towards and rotation away from the side to be manipulated. The high velocity, low amplitude thrust was directed superior and medially towards the opposite eye. NOTE: This technique should only be used by those who have been instructed in its use, and only following a complete assessment of the cervical arterial system. ↑ 3.0 3.1 Cleland JA, Flynn TW, Palmer JA. Incorporation of manual therapy directed at the cervicothoracic spine in patients with lateral epicondylalgia: a pilot clinical trial. Journal of Manual & Manipulative Therapy. 2005; 13(3): 143-151.